The initiative of organizing regular alumni meets implemented by Prof. (Dr.) S. N. Chauhan, Executive Director SDCET. 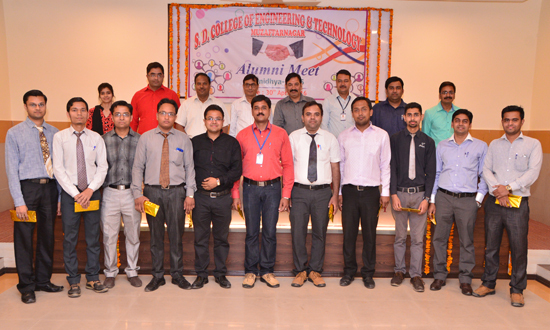 After the successful SDCET Alumni Meets in past, SDCETians celebrated the Alumni Meet on 30-04-2016. On the occasion, Dr. R M. Tiwari was the Chief Guest. Alumni of SDCET are serving in several organizations in India & abroad, SDCETian graced the function with their presence. The Alumni Meet started with lamp lighting ceremony by the dignitaries. Dr. R. T. S. Pundir Convener Alumni Meet welcomed the alumni. Dr. A. K. Gautam, Principal SDCET initiated the programme by giving brief about the inputs of SDCETians during the stay at SDCET and the efforts made by the SDCETians in taking the flag of SDCET to higher and higher heights with their efforts. Chief Guest Dr. R M. Tiwari focused on the importance of alumni interaction. From the alumni side, experiences were shared by Er. Gaurav Jindal (CS-2003), Er. Amit Garg (CA-2003), Er. Varun Kumar Sharma (CA-2002), Er. Neeraj Kumar (Sugar-2001), Er. Vivek Kumar (EC-2006), Er. Kunal Sehgal (CS-2004), Er. Nitin Saini (CS-2006), Er. Jyoti Aggarwal (CS-2010), Er. Vinay Rajvanshi (IT-2010) and many more. All the former students were presented with mementoes and gifts. The meet was followed by the group photograph and lunch. The organizing committee members were Er. Nitin Gupta, Er. Navnish Goel, Er. Ankit Singhal, Er. Sachin Sangal, Er. Ashish Bagla, Er. Vivek Gupta, Er. Saurabh Mittal etc.